Life’s so much easier when other people are there to lend you a helping hand, especially when it comes to moving house. While you can always go it alone, having experienced help by your side makes moving much less stressful. The following ten celebrities used to be truckers and could have been there to help you if you happened to have been looking for moving help when they were in the business. While they may no longer be trucking, and some are no longer trucking along in the world, imagine how much fun you could have had moving house if Elvis Presley or Chevy Chase were helping you move across town! That’s right, the King of Rock and Roll used to drive a big rig. Back in his younger days, before he crooned and swaggered his way to stardom, Elvis used to drive trucks across the United States at $1 an hour for the Crown Electric Company. Some people have even said that the King’s famous hairdo was inspired by truck driver fashion of the time. The man we all recognise as Bond, James Bond, used to drive massive 18-wheelers after leaving a stint in the Royal Navy. As the son of a truck driver, the open road was always in Sean Connery’s blood. The famous actor probably drew from this experience when he played the role of a truck driver in the film Hell Drivers. 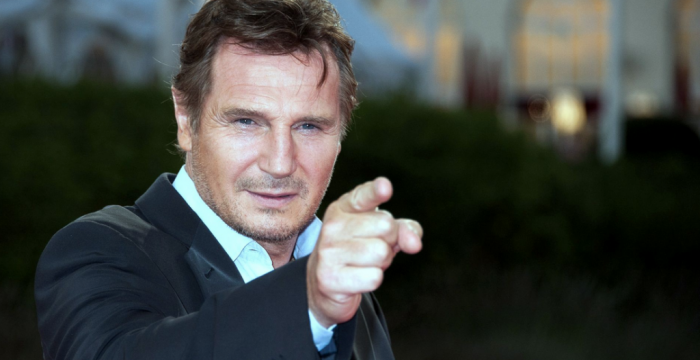 One of the most famous actors of the last few decades, Liam Neeson, might have never made it onto the silver screen if it hadn’t been for trucks. This megastar was initially encouraged to become an actor by his truck driving school instructor. If he hadn’t listened to this sound advice, he might still be working as a Guinness Brewery forklift operator or driving trucks around his native Ireland. The hilarious Chevy Chase is almost as famous for his diverse working life as he is for his funny acting. Before getting his big break on Saturday Night Live, Mr Chase studied medicine and worked as a jazz musician, a construction worker, a wine salesman, a motorcycle messenger, a taxi driver, and you guessed it – a truck driver. The rugged Charles Bronson is most famous for movies such as The Magnificent Seven, The Dirty Dozen, and The Great Escape. Mr Bronson wasn’t always an actor, however. He had a previous career in the army as a truck driver. Charles Bronson actually won a Purple Heart for his work as an army trucker and even trained to be a pilot. Comedian Richard Pryor had a career as a truck driver before hitting the big time, driving big rigs both in Germany and across the United States. This wild and crazy comedian was both hilarious and controversial, working as a trucker before joining the Army and later being discharged for stabbing another member. While not everyone loves his antics, chances are he would have driven a pretty mean truck. Unlike the previous celebrities who drove trucks before they became famous, Australian man Douglas Crabbe actually became famous for driving a truck. Currently locked down in Perth for multiple truck-related murders, the infamous Douglas Crabbe drove his 25-tonne Mack truck into a crowded bar inside a motel at the base of Uluru. Five people were killed and 16 people injured in this 1983 attack that left a huge stain on the Aussie landscape. Bradley John Murdoch was another infamous Australian trucker and multiple murderer. Currently held at the Darwin Correctional Centre, Murdoch is serving life imprisonment for the 2001 murder of English backpacker Peter Falconio. This horrific true story set in the Australian outback influenced the famous Wolf Creek movie. Well-renowned German-American poet and author Charles Bukowski supported his art with trucking. This man made a huge cultural and social impact on the American intellectual landscape, with Mr Bukowski originally working as a truck driver in order to support himself as a writer. The famous and well-respected movie director James Cameron was once a truck driver. Who knows, maybe he got some of his inspiration for Titanic and Avatar while he was behind the wheel. Mr Cameron only quit truck driving after a viewing of Star Wars in 1976, which is when he made the pivotal decision to enter the world of film-making. None of these famous characters are on our team, but we are staffed by plenty of friendly, reliable, professional removalists. Get in touch today for a free quote.